Creative class planning can be a struggle if you don’t know where to start. After spending many, many, many hours planning classes my first few years at Body Harmonics, I finally figured out a formula that made class planning make sense. I’ve used this formula myself and also taught it to many others. Everyone has reported great success. Not only is it straight forward, but it also creates the opportunity for a meaningful class filled with magic that keeps participants interested and wanting more. If you’ve ever been stuck coming up with a creative class plan, or if you want to infuse your current classes with a bit of creativity, give this process a try. Then let me know what you think in the comments below the article. I’d love your feedback! Your theme can be anything you want. It can be a spinal motion like rotation, a Core Integrity system, a concept like “length”, pushing or pulling for senior populations, gait mechanics, athletic training, making exercises like roll up effortless, you name it. The possibilities are endless. It’s easy to get carried away here. If you brainstorm a list of 5 , 10 or even 25 different theme ideas, don’t try to use them all at once. Save them for another class. You can, and will, repeat this process over and over again! At this point, choose one theme and stick with it throughout this process. Identify what you want your end result to be by the end of class using this theme. Why do you want to teach this theme? What do you want your participants to learn? What do you want them to accomplish? How do you want participants to feel? What do you want to get out of the class as a teacher? There’s no right or wrong here. You want to identify the purpose for what you’re choosing to teach so you know why you’re choosing to teach it. You may choose to use it in your cueing later, but you don’t have to. Some examples of class purpose are to correct postural imbalances, prepare for an activity, boost body awareness, keep the class Osteoporosis safe, make your class work hard and sweat. Anything goes. This step has a few parts to it. In the beginning, you may have to spend more time on step 3. Don’t worry, this is a normal process. When I first started teaching, I’d spend 2-3 hours on some class plans. Trust me, this won’t last forever. As you gain more experience teaching and designing classes, this part will take much less time. It will also become more organic and natural for you to do. Take out a separate piece of paper. Write your theme in the center of the page. Without judgment, write out a list of anything that relates to that theme. This includes exercises, variations and progressions, movement cues, images, small apparatus. Anything you can think of. Don’t assess whether it’s a good idea or not, just write. Get it out of your head and on paper. Sometimes I like to get on the mat and play around. I may start with typical exercises, but then I’ll move around and create new exercises and variations I would never have thought of sitting at my desk. They’re often more fun, organic and a fantastic addition to the class. I like to use a highlighter or different colored pen for this one. Grab one if you can. On your brain dump page, highlight or circle the positions that are used in the exercises you’ve listed. By this I mean supine, prone, side lying, quadruped, etc. Now that you see the positions you’ve got to work with, think about a logical progression for the positions you’ll use in your class. If there are too many exercises in one position, you may want to balance this out and add some variety. Take out another sheet of paper. Fold it in half and crease the page. There should two columns on the page. List your positions starting from top to bottom down the left hand column and continuing top to bottom on the right hand column. You want more or less even space between each position. Most classes will have 6-10 positions listed. If you’d like your positions to stand out, write them in a different color pen or highlight them. Personally, I find this easier to see. You’ll figure out what works for you. Under each position, add your exercises, variations and progressions. The progressions we teach in Module 1 of Matwork Intensive at Body Harmonics is where the magic will really happen. Make sure to use these! Don’t forget to decide on your core cues and images you will use throughout the class. Here’s an example of a class plan started. 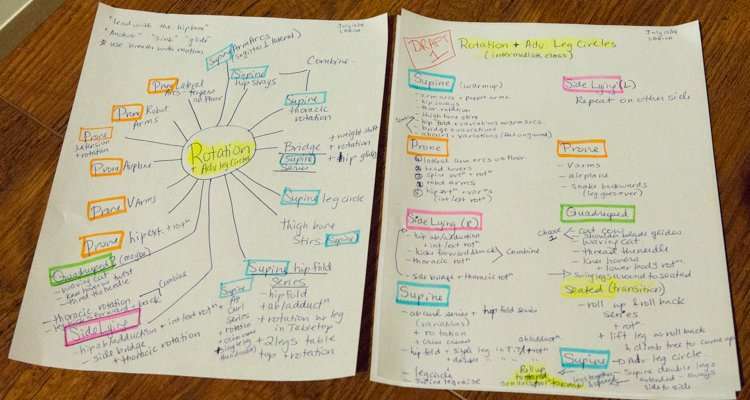 The brain dump/mind map is on the left and draft 1 of my class plan is on the right. Take a look at your class plan. Is the class designed to achieve your end goal and fulfill the purpose of the class? Does it follow basic principles of class design? Does it have a good flow? Are the exercises and variations chosen appropriate for your population? Do the core cues and images fit with the plan as a whole? If there’s a bit more work to do, keep massaging and fine-tuning as needed. You may need to get down on the floor and try pieces of the class as you complete this process. A quick tip: if it feels good to you, it’ll probably feel good to others too. Really tune into your body as you go through your class massage and fine-tuning process. Once everything makes sense, go ahead and try the class. If you’re as creative on paper (a.k.a., a little messy), you may have to re-write the class plan or type it up so you can see it easily. Now that you’re done your class plan, go ahead and give it a try with class participants. Try it with several different classes and see how each class plays out. You will likely teach the same class plan a bit differently each time based on the participants you have in class. Make note of these differences so you can keep learning, growing and have fun with your class planning the future. Did you find this class design process helpful? If so, what stood out the most to you? Do you have any other processes or systems you use for your class design that you’d like to share with others? Please share your answers in the comments section below the article. As a new pilates teacher, I have found your posts so valuable. It’s filled in the spaces that my certification program left open. Thanks for sharing!!! I’m so glad the posts have been helpful, Michele. As a new teacher, you’ll have many ‘light bulbs’ go off for the next couple of years. Enjoy the adventure! When I was studying for my certification, we were encouraged to prepare for clients in our heads, but definitely not on paper. That approach didn’t work for me, so from day 1 I have planned out classes on paper, both for groups and privates. That’s not to say that I don’t change things up if I need to during the class, but I feel so much better being prepared when my client arrives. I don’t know anyone else who does that, so I was so glad to read your article! Glad I’m not the only one anymore! Hello! I just want to say how much I love this article and this website! This article is HUGE – I am just getting ready to test out of my certification program and this feels like it was the missing link. I just kept looking at this list of exercises and thinking that I had to teach it as is – no real rhyme or reason, and you have opened up my whole world right now!!! I feel so much more confident and this just makes perfect sense to me! Thank you so much for filling in this missing piece of the puzzle for me! You’re so very welcome. It’s great that you find this article helpful. When I started teaching, it was also challenging for me to formulate classes that made sense to both myself and my participants. I’ve carefully observed soooo many classes and tested many different ways of designing them. This method took me a few years to develop, but seems to get the most consistent positive results for both new and experienced teachers.